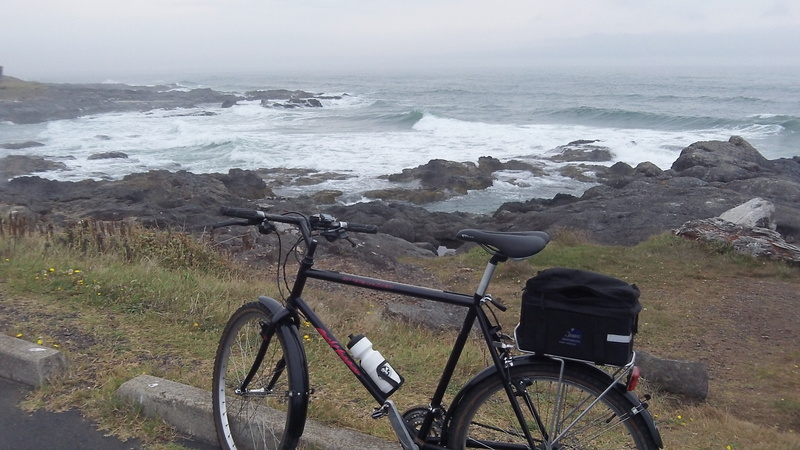 On the cool coast near Yachats, where global warming makes frequent exceptions. In the valley a couple of heat waves have set new temperature records this summer, lending emphasis to the persistent talk of global warming. But on a mid-summer bike ride along the coastline Sunday, it was in the 50s and most of the people I saw on the beach wore some kind of jackets. At mid-afternoon, the Weather Service reading for Florence was 57 degrees and fog. The climate may be warming in various parts around the world, but the weather gods responsible for the Oregon coast did not seem to get the memo. Getting back from my ride, more or less chilled, I turned on the heat. That prompted me to look up the website of the Central Lincoln People’s Utility District, which reported the regrettable news that the PUD’s board had approved a rate increase that will increase the average customer’s bill about 7 percent starting this month. As it happens, the district’s biggest cost, about 60 percent, is power supplied by the Bonneville Power Administration, which plans to boost its prices almost 7 percent this fall. With that expected increase, BPA wll have raised its prices nearly 29 percent since 2010, according to the PUD. And that’s without having any coal-burning generating stations that need to worry about Obama’s crackdown on carbon emissions. The term is “global climate change”, not “global warming” and saying “well, it was cold at the coast today!” does not disprove it. The point is that the planet in general is warming, causing more extreme weather, not that Newport will suddenly become Miami Beach. Although Newport might have the same flooding issues as New Orleans if ocean levels rise enough. There has always been “climate change”! Maybe it’s about time the oceans get back up to where they’re supposed to be? And just how many years of post graduate education in atmospheric physics did you complete to make this observation? I’d guess it’s just Fox News…. Well, I do not think attacking a person’s education will lead to a healthy debate. However, I would say that Hasso brings up an interesting point when he talks about localized temperature fluctuations. Getting an average temperature reading for the earth is very, very difficult. For those who believe in man-made climate change, they must accept that temperature readings from 100+ years ago are scientifically the same as global readings today. They also must believe that a 0.8 degree increase over that span constitutes a significant increase. Finally, they must believe that carbon emissions cause ‘surface’ warming despite the past decade which saw global temperatures drop despite higher levels of carbon emissions. I am not saying we should pollute to our heart’s content. Rather, we should ask ourselves, what is an acceptable level of fluctuation and what is the ideal global temperature. If we do not have a goal, how can we possibly hope to succeed? Quit watching Fox News and start reading Scientific American and other science journals. What you said above, is just plain wrong. The science is out there if you’re willing to read it. And the idea that people can regulate a planetary system to an “ideal global temperature” is something out there in science fiction. And we HAVE goals:a reduction in net output of energy from fossil fuels by using sustainable/renewable sources and reducing, human introduced increases in carbon dioxide, methane and other chemicals that are proven to reduce the naturally occurring radiation of heat into space. Bob, you can do better than that…..
Fox News is the excuse ALL liberals use when a view they disagree with gains traction. All you’ve done is prove how deeply YOUR head is buried in the sand. I get ALL sides, yes…including MSNBC, even though I often want to vomit after about 10 minutes of Balart, Sharpton, or Matthews. By the way, as a kid I found all kinds of shellfish fossils in my back yard in North Albany……so in the distant past, either the oceans declined or the ground rose up from the oceans. Tell us Bob, with your vast knowledge…which was it? Thanks for agreeing with us. Mr Woods, I stopped watching news years ago when my son was born and we had to trim the budget. I got the 0.8 change from NASA. So, you are wrong on two accounts. Again, personal attacks do not encourage debate. So please stop being ignorant and forming drive-by impressions based on 156 word replies. Sure miss your voice of reason from the Democrat Herald. In fact, we stopped the paper because it is going downhill. Thank goodness you’re on the internet. Keep up the good work and common sense way of seeing things.